Eden spans three decks at the aft of the ship with almost 7,000 sq. ft. of glass surrounding the venue. It features the largest window to the world and helps guests connect with the sea. Eden is a space that flows with life, and transforms throughout the day. In the morning, Eden is a space where yoga, a good book, or coffee is enjoyed with breathtaking views of the world. In the afternoon, Eden becomes more playful through the added entertainment of sitar players, aerialists, and much more. 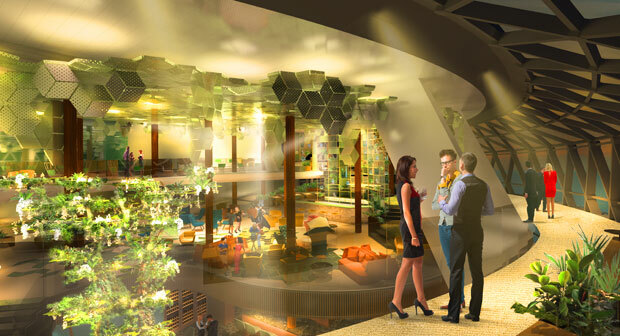 As evening falls aboard Celebrity Edge, Eve at Eden begins, which is a “sinful” fusion of performance art, culinary delights, and nightlife. The Eden Restaurant promises to indulge guests’ every sense through culinary temptations that are sure to surprise and delight. 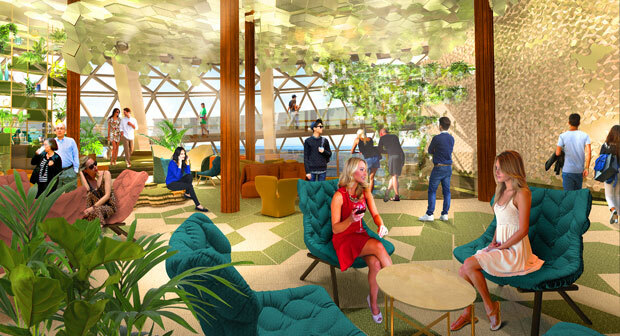 After dinner, guests can experience cocktails at the Eden Bar with fresh ingredients from The Tower of Plants, which can be found eighteen feet above the Eden Bar. The inspiration for Eden’s design comes from the golden spiral generated by the Fibonacci sequence, which can be seen in nature in a rose or in the swirl of a snail’s shell. At Eden it is brought to life through the architecture, including a 90-meter ramp surrounding the venue that allows guests to discover the wonder of Eden at their own pace. “When creating Eden, my goal was to create a connection to the sea in a space that will stir imaginations and leave lasting memories of the travel experience,” said Scott Butler, one of Eden’s designers, AIA, and founding partner of Wilson Butler Architects. Eden’s home is the Celebrity Edge, Celebrity’s newest ship. Celebrity Edge’s homeport is Fort Lauderdale, Florida and she is scheduled to make her first sailing on December 16, 2018. Two 7-night itineraries will be offered: an Eastern and Western Caribbean cruise. Travelers also have the option to book back-to-back sailings for a 14-night trip. Celebrity Edge will be joined by three sister ships in 2020, 2021, and 2022. For more information about how you can experience everything the Celebrity Edge has to offer, please visit our website or give us a call at 1-800-377-9383. 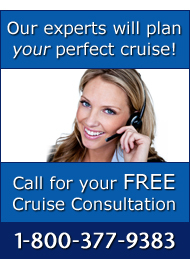 Our cruise consultants are excited to help you plan your perfect getaway! Interested in information on the Caribbean Cruise in 2018. The Garden of Eden is a wonderful concept. Hi Bernadine! Yes this looks like an amazing concept. The Edge will start in the Caribbean in Dec 2018. I’ll send you an email as well. I look forward to assisting you on this new ship!